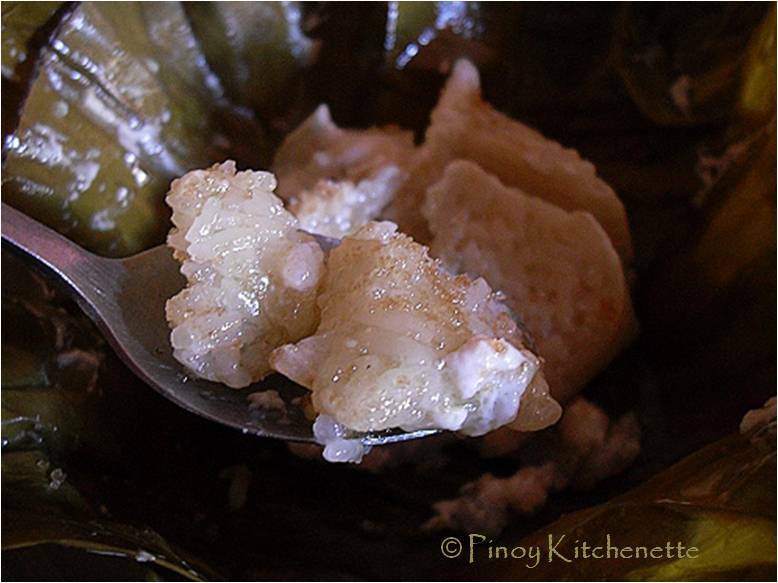 This is the first time time I tried to cook Binutong(bi-nu-'tong) and am glad i made it perfectly right like the ones I used to taste in Bicol ~ maliputok and masiramon (creamy and delicious). 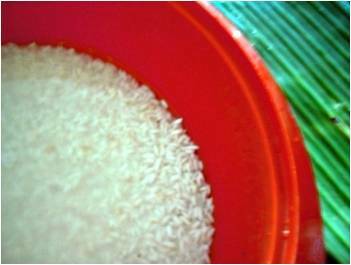 Wash glutinous rice, then soak in water for about 30 minutes. Remove water, then add the coconut cream and dash of salt. Soften banana leaves over heat so it wouldn't be stiff and wont tear up easily when we use it for wrapping. 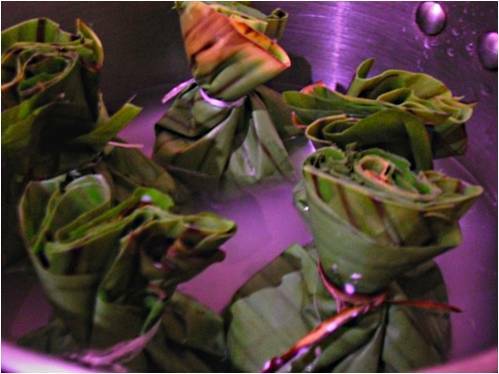 Place banana leaf in a bowl, push the center part to make a basin-like mold , then scoop about half cup of rice mixture, secure the edges to make a pouch, then tie tightly. This mixture makes about 10-12 pouches. 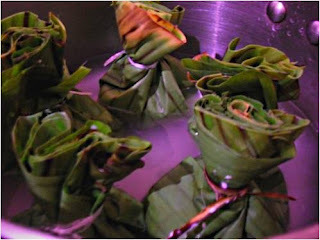 Place the pouches in a pot with water. Water level should be about halfway to the sides of pouches. 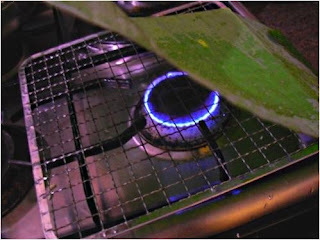 Cover and cook for about an hour over medium low heat. 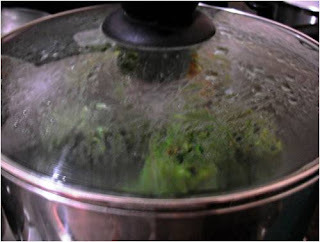 Then remove from the pot. Serve warm. 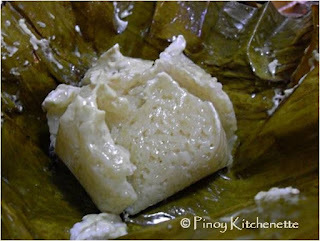 This is how it looks like when it's cooked. Dig in! Enjoy with a cup of coffe or hot choco. 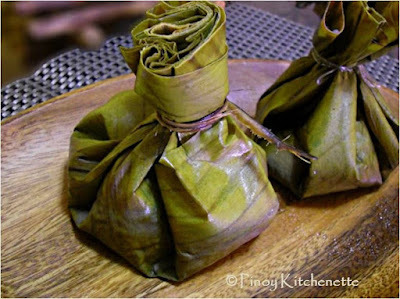 maybe you're referring to the"suman sa ibos:, the one wrapped in buli leaves. These two variants differs with taste :) promise! Receta muy interesante y deliciosa ,se pareecen mucho a nuestras humas de maíz ,muy ricos ingredientes,abrazos hugs,hugs. sa amin sa sorsogon we call it binut'ong.talagang masarap ang binut'ong lalo pa kung maraming gata.69 years old na ako,since I was a kid paborito ko na ito.masarap kainin ito na may partner na hinog na manga.kung walang manga,asukal puede na. 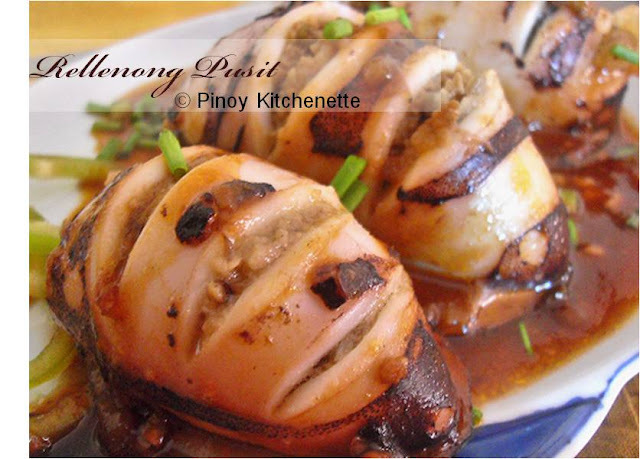 thank you pinoy kitchenette,ican cook already my own BINUT'ONG. Thanks for posting this. I loved eating this for breakfast. I'm a bicolana too. Born and raised in Naga. Do you remember the violet Kalamay? That's my fave. 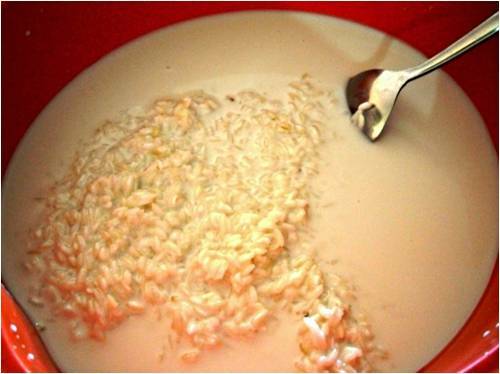 Thanks for posting, I remember eating this when I was a child, can't wait to make it. Thanks! 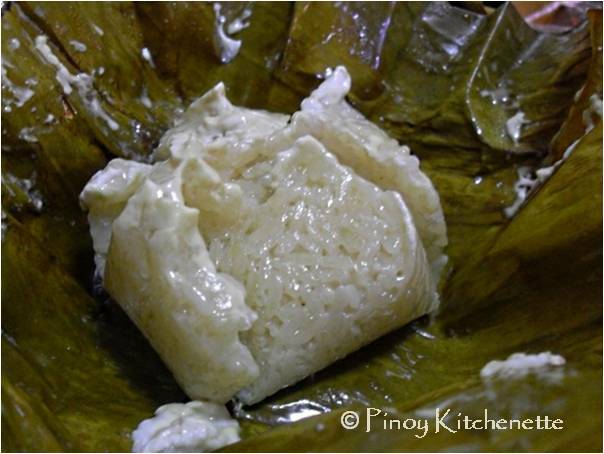 glad to hear from people like you who really appreciates this simple bicolano food. hope you enjoyed it! 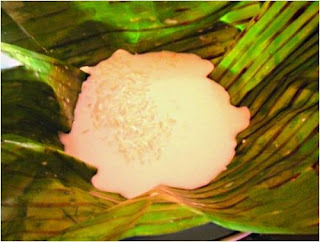 We call this "pinuyos" in Camarines Sur - Rinconada area. This baby is really good for merinda or snack with ice cold Coke. 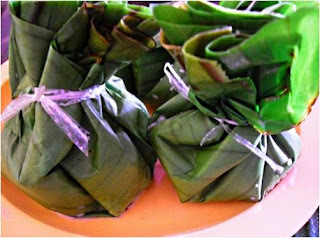 tnx for sharing d recipe....my favorite agahan back in Bicol...Binut'ong ay mas masarap kesa sa suman :-) lalo pag madaming liputok na gata. thanks for the info i have been craving for this in years. now i will be able to reminisced my lola;s way of it!! !